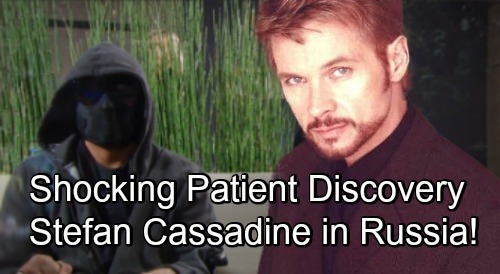 General Hospital Spoilers: Stefan Cassadine Revealed as Boronsky Clinic Patient – Stunning GH Comeback Brings Major Drama? General Hospital (GH) spoilers tease that some jaw-dropping revelations are ahead. GH loves to create storylines that ultimately collide, so we could be building to that scenario once more. For starters, let’s consider Peter’s (Wes Ramsey) admission and where that plot’s headed. During a chat with Robert (Tristan Rogers), Peter revealed what he knew about Patients 1-5. It turns out Peter was exaggerating a little. He didn’t really have that much to offer, but at least we got a couple crucial tidbits. Peter confirmed that Dr. Klein indeed had five patients held at the Boronsky Clinic. The doc had varying degrees of success with the people who came before Jason (Steve Burton). Robert pressed for details, but Peter suggested that he’d have to ask Dr. Klein. He could only reveal that the patients were moved for further study. However, that means five mysterious individuals are still out there. Some of them may have been sent on missions by now and others might remain captive. That brings us to the storyline this could collide with. General Hospital spoilers say Valentin (James Patrick Stuart) will discover new information on August 20. He’ll find out a stunning family secret, so that’ll let GH work the Cassadine angle. If this ties in with Dr. Klein and his guinea pigs, that could certainly create the perfect storm for drama. Returns from the dead are common on soaps, so that’s an interesting option to consider. Will a deceased Cassadine family member turn out to be alive? If so, Stefan (Stephen Nichols) would be a great character to bring back in the picture. Nichols is still airing over on Days of Our Lives, but he wrapped filming months ago. That could leave his schedule clear for a GH return stint. Did Stefan somehow end up at the Boronsky Clinic for experimenting? He could be under Dr Klein’s mind control, which would further complicate matters for Valentin and the rest of the Cassadine clan. DOOL’s loss could be General Hospital’s gain if the show gets on board. It’s safe to say many GH viewers would be thrilled to see Nichols back in the role. General Hospital spoilers say Valentin will mull over the shocker he uncovers and plot his next move. Will this bombshell pave the way for Stefan’s comeback? We’ll give you updates as other GH news comes in. Stay tuned to the ABC soap and don’t forget to check CDL often for the latest General Hospital spoilers, updates and news.